The poorhouse with its “dirt, lice, poverty and starvation” was built up on top of the haystack in the barn at Hässleby gård. The paupers were locals. Emil’s blessed Christmas delivery was filmed in the middle of summer. The window used by the paupers to climb out of was a part of the scenery, and when they came out on the other side they found themselves in a snow-covered Kramfors. “We’re betrothed to each other, anyway”. Along the row of red outhouses Alfred and Lina were strolling along at the fair, looking for rings. The houses hade been painted to look like display windows. “Pesky little brat – it’s the woodshed for you…”. The woodshed scenes were shot in these humble buildings at Norra gatan which today house a workshop. Jan “Emil” Ohlsson was given a piece of soft balsa wood to carve, because carving figures from ordinary hardwood is very difficult. In Gibberyd (Katthult) a Snickerboa was built for the outdoor scenes. The school became the film crew’s headquarters. Jan “Emil” Ohlsson lived at the boarding school together with a school teacher who tutored him during the filming periods (actually the same teacher who tutored Inger “Pippi Longstocking” Nilsson). The whole Ohlsson family came from Uppsala to spend the summers in Mariannelund, and a number of locals were friendly enough to provide lodgings for the members of the film crew. The indoor scenes to do with Emil’s visit to the doctor in Mariannelund were filmed at Mariannelund’s Norra gatan, where the interior depicting the doctor’s surgery was created. A row of young and old extras were sitting in the waiting room feigning sickness and need of care when Emil entered with the soup tureen on his head. “…if you’ve even been in a forest in Småland”. Several outdoor scenes were shot in Södra Bråta, high above Silverådalen. This piece of nature, farmed in days of old, is today a natural reserve. “Ah, a sausage”. Emil sneaked into a little store in Grönshult, north of Katthult , to eat a hot dog. This is where the horse and cart scenes were filmed, as well as the school yard scene, with children from Mariannelund as extras. Other outdoor scenes were filmed in the nearby village of Nedrakulla. “The Småland Hussars to the attack!”. In the meadows by the shores of Skurusjön Emil attacked the early dawn birdwatchers from Hultsfred. A “must see” if you want to follow in Emil’s footsteps. Here in the Gibberyd village, 10 km north of Mariannelund, is where most of the Katthult outdoor scenes were filmed. Some scenes were also shot in the farmhand’s cottage and in the barn. Here you’ll find the main house, Trisseboa, Snickerboa and other buildings as well. This is also where you can view the wolf ’s trap and the tree that Emil and his dad jumped from. “It’s the Watersprite that’s took ’im”. Around Hulta såg by Silverån, the Katthult guests were searching for Emil when he had disappeared. This is also where Emil dropped his father’s hat in the water. 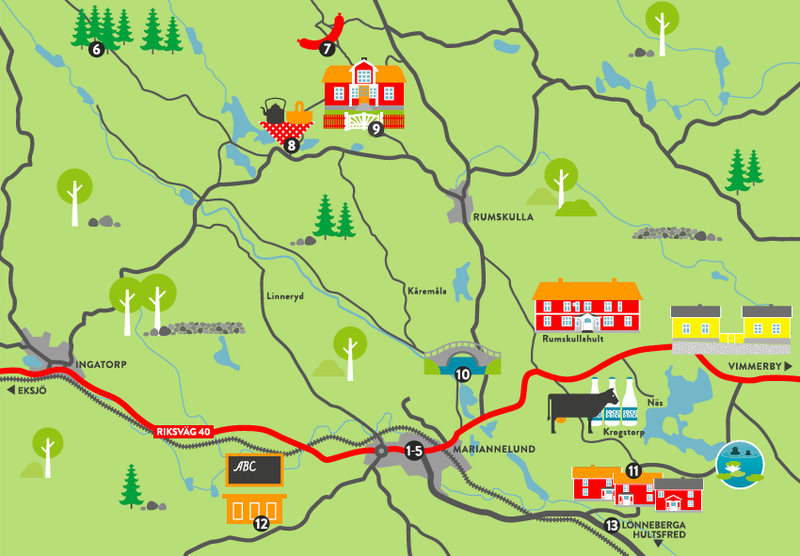 Barely 10 km east of Mariannelund is where the real Bullerbyn is situated. Astrid Lindgren’s dad grew up here, and it’s these – the three Sevedstorp houses – she is describing in her books. In 1986 the film about the children in Bullerby was shot here and in other places around Mariannelund. “Have you ’eard, Emil at Katthult has drunk ‘isself legless”. In Rölund’s school building, a few kilometres southeast of Mariannelund, Emil’s school scenes were filmed. The visit with the Good Templars was also shot here, when Emil and Griseknoen (the Piglet) struck a sobriety oath. Astrid Lindgren’s first book about Emil i Lönneberga, which was released in 1963, had drawings by the artist Björn Berg and was soon loved by all. We extend you a warm welcome to Lönneberga where you can view the natural size Emil sculpture that has been created by Björn’s son Torbjörn Berg, based on these drawings.